Tribe of Kings Original Sunday Night Dance since 1997. Reggae Sundays with all ToK selectors. Drink specials and bottle service available. ForVIP/Booth reservations email vip@tribeofkings.com. 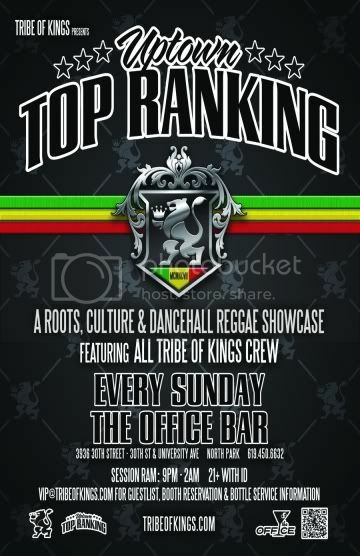 Uptown Top Ranking with the Tribe of Kings is consistently top notch. Each Sunday is good, never a off night! If I'm out of town, that's the only reason why I wouldn't be here on a Sunday night! TOK mad RASPECT! Boom! Tribe of Kings runnin tings in SD! This place is amazing... Never had a bad night there. Eclectic mix of Roots, Culture and Dancehall. Mixed/Diverse/Fun fun crowd! I took a trip down to SD one weekend and went to this club. One of the dopest reggae clubs I've been to. Good mix of roots and dancehall.